One of the main strengths of PHP is its support for a vast number of databases. Very often, PHP and MySQL are viewed as an entity. However, other databases have their strengths, toofor instance, it took MySQL a very long time to support features that are considered standard in other systems; however, MySQL is known to be very fast. This chapter tackles quite a number of databases and shows the basic operations with them: connecting, sending SQL statements, and evaluating the return values. No matter what your database-driven web application must do, it always has to do these steps. id An integer value that is increased by 1 for each new entry entered into the database. Depending on the database system, the data type is either called IDENTITY, auto_increment, or something similar. quote The quote, as a VARCHAR(255); this length works with all systems. author The person who produced the quote, as a VARCHAR(50). year The year the quote has been produced (sometimes, this is highly speculative), of type INT. Every database system comes with either management tools or third-party products available. 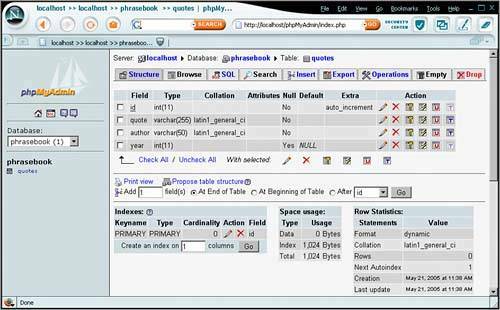 For instance, the PHP-based phpMyAdmin (http://www.phpmyadmin.net/) shown in Figure 7.1 offers very good access to a MySQL installation. Figure 7.1. 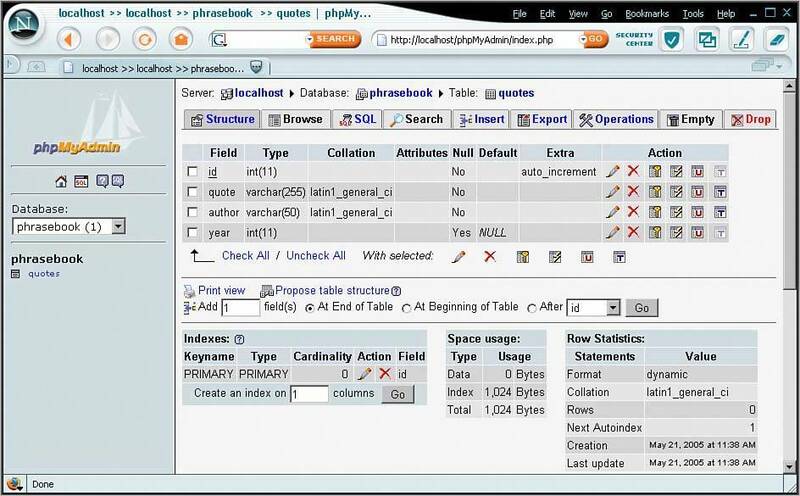 Managing a MySQL installation using phpMyAdmin.